Maybe not so perfect. So, I stored the idea back in my mind for future use. My brain hurts sometimes because I try to keep too many ideas. 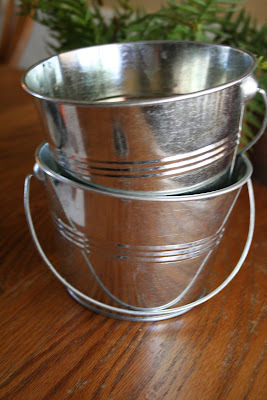 Anyway, I see these great little tin buckets for $1 a piece and bought a couple (they're great for storing crayons, sidewalk chalk, binkies, etc. They caught my eye though because of the shape and the little metal rings that they were connected with. The anthro pot suddenly came to the front of my mind. Cha-ching! They're not going to look exactly like Anthro's but the look will be inspired by it. 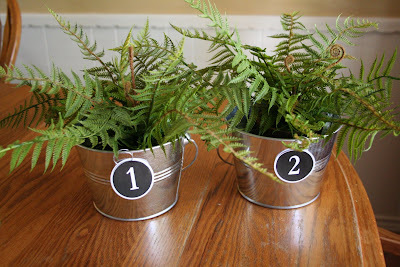 First, I'm going to take these little fake potted ferns I found at Michaels for 2.49 each. That whole store seems to be on clearance! These are the same ones I used outside~love them, so I bought some more. So, now what do I do with all of these?? Make a number label for everything in my house? My daughters don't have their ears pierced yet and have tried to clip some on as earrings. My son tried to clip them to his nose. I love those numbered things that keep floating around out there. Flowerpots, stools, steps, the list seems never ending. I love the way you did this, because I love the Dollar Spot and it's such a simple project with such cute results! Thanks for sharing! 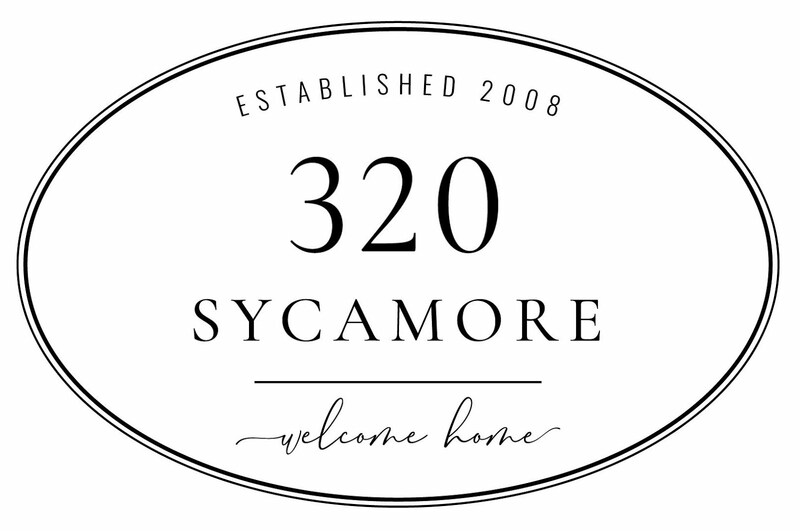 Stop by to see me anytime! Love it! I was also coveting those cute anthro. pots and thinking of ways to do it on-the-cheap. Thanks for the ideas :). Sounds like your little ones have your creative streak! ;) I love your versio of the pots! Numbers - Cute circles - screams advent calendars to me....good luck. I almost spit out my coffee when I read that your son tried to put them in his nose! Sounds like my brothers!! So cute! I haven't been in Target for a while...better check it out! Gotta love it when you can not only spend less but be proud of doing it yourself. Great job. Very creative..love it when a project comes together...and for a dime no less!! They look great!! How cute are these?! Wow, love your creativity :) You have a lovely blog and I'm enjoying it! So Cute! I have one of the little buckets hanging on a window I converted to a chalkboard to hold the chalk. I love your numbered buckets. They look better than the real thing. 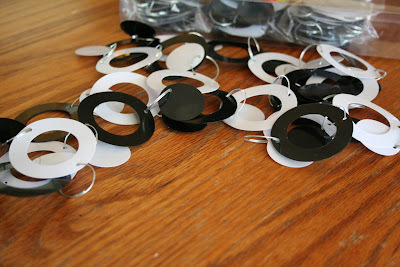 I saw those at anthroplogie, too, and said "HMMMM-how to duplicate that..(for less!)" . Now what a gift-you have done all the thinking for me! I love how yours look and I will be heading to Target asap! I even wrote about your idea on my meagher blog! cute! I love creative rip-offs! They usually look better, too! Wonderful little project. Love the ferns too. 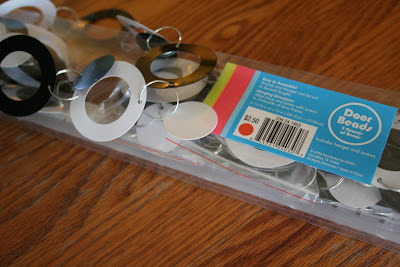 What a great vision to use the doorway hanger for the tags! These are fantastic! What an inspired idea! 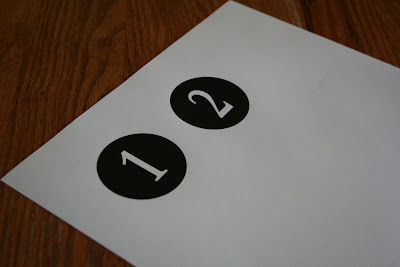 I'm loving the black and white "numbers" trend in Blogland. Nice crisp look! You are SO creative, what a great "copy"! genius, I tell ya. Very cute! :) Wonder if my dollar spot has those... wonder if they have other colors, too. Great job! 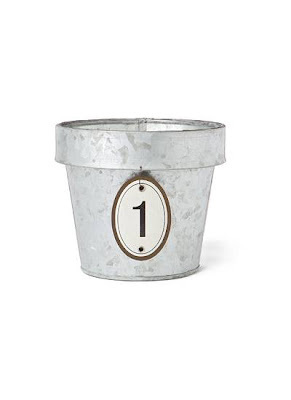 I'm always on the prowl at Target's $1 spot for silver buckets like those...they're the best! I LOVE the pots! So crafty! And good tip about Michael's. 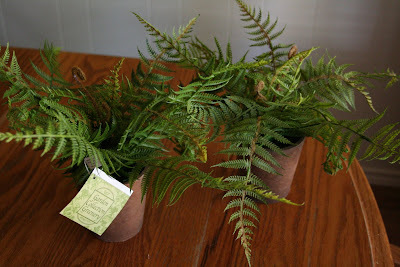 I might have to sneak over there today to see if they have any more of those ferns...thanks Melissa! What a great DIY project! Love those crafty little planter pots! When you get the chance, check out my new blog! How about initial tags for birthday gifts etc? I LOVE these! What a great idea! So cute! Love them! Love those! I picked up a bunch of those little buckets at Target too. I guess I'm going to have to do something like this now (because what would I do if I left anything in my house unnumbered?) LOL! This is such a great idea...love, love, love. Thanks for all of the great ideas! They look great! I love the dollar area in Target too. I always seem to find something I want.. ummm need. Very cute! 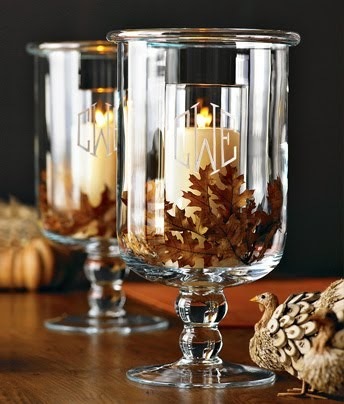 You can always use the rest for wine glass charms for guests at parties. You have so many that you can "afford" to put your guests names on them, then they'll serve a dual purpose as glass charms and place cards! You can also just put themed shapes or simply number them if you don't want to commit too much!